Just before we shut down for the year, we'll play a little catch up with events that have happened around and since #NZWF18, congratulate a whole bunch of people on their recent achievements – and wish you all the best for the holidays. We are pretty much done putting our 2018 edition to bed, and have been looking forward to a break - which started when this was sent. Here's (almost all of) Team #NZWF18 being told that the drinks are on us. Before we continue, we'd like to take a moment to mark the passing of filmmaker Geoff Murphy, who early in his career made iconic NZ features Goodbye Pork Pie, Utu and The Quiet Earth. Several members of Geoff's family work in the local screen industry, including his daughter, Robin, who's the producer of one of our #NZWF18 winners, Pot Luck. We extend our condolences to all Geoff's family, friends and the wider NZ screen community on the loss of one of their finest. The Web Series World Cup has wrapped for another year, and – as has looked fairly likely for quite some time – the crown has been taken by Aussie Steve Baker's animated gem This is Desmondo Ray!, although French time-travel show Nemausus gave it a very good run. Mucho congratulations to Desmondo, who has racked up over 40 awards on his travels. His WSWC win tops off a great year for the Aussies. They had six shows in the final WSWC top 20 including Patricia Moore, which took two awards at #NZWF18 and the bronze spot on the WSWC podium. Check out the full table on the WSWC Facebook page. We look forward to being part of the WSWC again in 2019. Connected Media is commissioning a third series of Someday Stories, short films based on the theme of sustainability, for production in the first half of 2019. This is a genuine, career-starting opportunity for emerging film-makers, and applications are open until December 13. 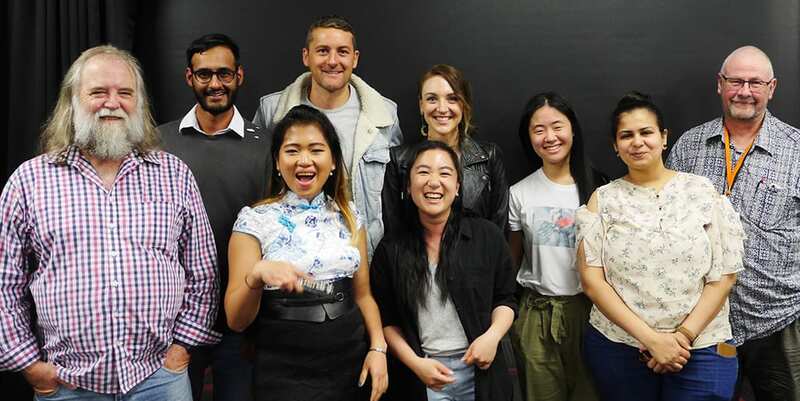 Each successful film-making team will be provided with a production budget of up to $10,000, and a mentor from the New Zealand film industry. The team at The Outlook for Someday will manage the project. Previous Someday Stories have explored sustainability with subjects as diverse as eating disorders, migrant life, gay conversion therapy and healing from family violence. The Outlook for Someday acknowledges the amazing support received for this initiative by NZ On Air, the New Zealand Film Commission and The Body Shop. For more information, go here to apply by 13 December. For awards junkies, there are still a few bashes to run this year. The International Online Web Fest (December 7 – 8) and two British events, the UK Offline Web Fest (December 7) and Ace Web Fest (December 8), will shortly announce their winners. A bunch of #NZWF17 and '18 selections are in the mix at those events, including The Cell, Dele Viaje, Fast Heroes Sixty, I'm Ander, Ink, Nemausus, Sparebnb and Spectrums. And the Asia Web Awards, where Lucy Lewis Can't Lose is in the running, will announce nominees on 8 December and live stream its awards on 15 December - which we believe is the last web series awards event of the year. 16 of our selections in NZ were also award nominees at Rio Web Fest, which ran the same weekend as #NZWF18. Bidune Kaid, Nemausus, The Pantsless Detective and Patricia Moore came away winners, along with H2Ow's Ao-terror-oa. Below is the winner of our Best Actress, NZ Narrative award (and #NZWF16 host) Britt Scott-Clark, sporting the look that helped make Ao-terror-oa: Burn Time Rio's Best Makeup winner. Here in NZ we're not short of our own awards bashes at this time of year, and the NZ TV Awards ran in two parts, either side of #NZWF18. Baby Mama's Club (below) was a joint winner of our Best Ensemble gong and less than a week later stepped up to take the NZTVA's Best Web Series crown. The other online show coming away with a NZTVA gong was Tikilounge Productions' Tales Of Time for Coconet TV, which took Best Pasifika Programme. Coincidentally, Ao-terror-oa and Baby Mama's Club are the two NZ shows named in the line-up for Miami Web Fest, announced over the weekend. They'll be joined there by no less than 16 other #NZWF18 shows. In timely manner, here's the freshly-released season 2 of Baby Mama's Club for Kiwis to watch via TVNZ. If you're not in NZ, or roll with a VPN, you can enjoy the show on YouTube. If the Mamas aren't enough fun to fill your entire holiday season, you could do worse than revisit our winners page and track down some of those very fine shows. And if that's still not enough viewing pleasure, broaden the horizon with a look at our nominees or selections pages. There's no newsletter in January, so here's a bumper crop of submission deadlines to keep you busy until we open #NZWF19 submissions on 1 February. Thanks for reading. Happy Holidays! We'll see you next year. Until then, follow our social media channels - links below. Yes, that was a hint!